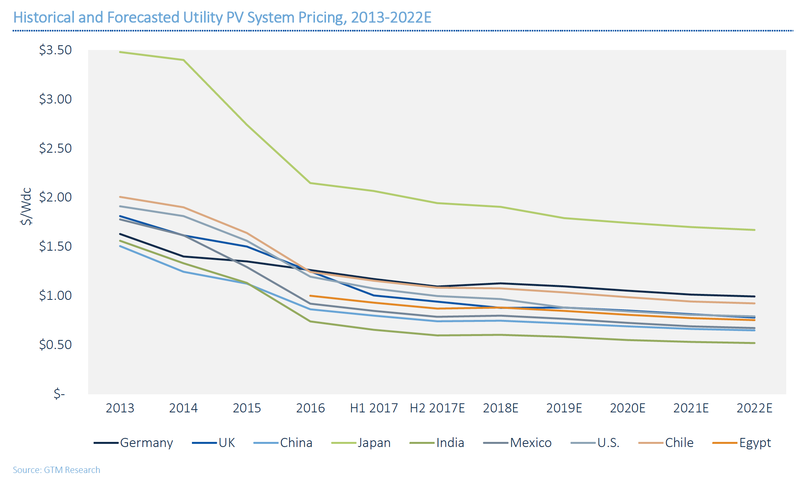 A new report from GTM Research has highlighted what is becoming an increasingly common refrain these days — solar prices simply continue to fall, and they’re not slowing down, either, with GTM predicting that average global solar project prices will decline 27% by 2022. The latest to sound this refrain is GTM Research Solar Analyst Ben Gallagher, who authored a new solar PV system pricing forecast this week which predicts that the continuing downward trend in solar project prices will not simply be driven by price decreases in modules, but from reductions in inverters, trackers, and even labor costs. Further, every region is expected to benefit as well. 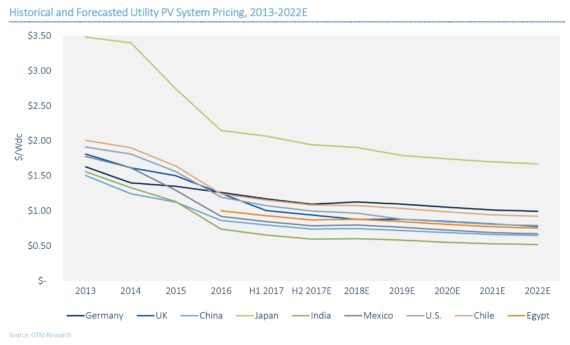 The most recent record prices come from India, unsurprisingly, given that Gallagher explains that the country’s system of tenders has produced consistently and extremely competitive bidding, which obviously leads to “almost unimaginably low system pricing.” In fact, according to Gallagher, “India is seeing the lowest system prices of any major solar market in the world, ever.” Most recently, the report highlights, India has utility-scale solar PV system pricing of 65 cents per watt — that’s seemingly impossible, if we were to time travel back a few years. Of course, one of the reasons for India’s dramatically low costs is the fact they pay their labor force next-to-nothing, resulting in much lower soft costs, as shown below. The report also looks into the potential pricing impact in the United States of the Suniva 201 filing, which could have significant and dramatic disruption on the US solar sector. I’ve already covered this news a little bit lately, primarily in the wake of news from the Solar Energy Industries Association’s claim that the US solar industry could lose 88,000 jobs, or a third of its workforce, if the US International Trade Commission (ITC) rules in favor of Suniva’s request for a tariff and price floor on solar parts. 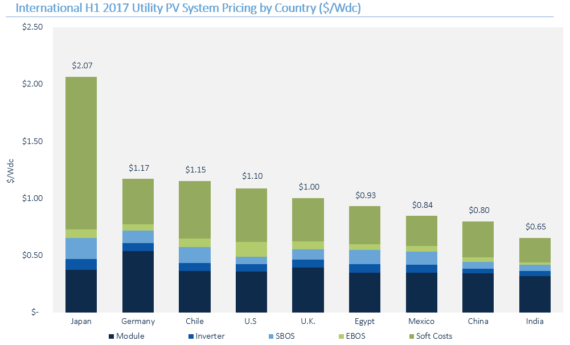 Additionally, GTM Research dug into the ramifications of the move — a move which, if approved by the US ITC, would place a $0.40/watt tariff for cells and a floor price of $0.78/watt on modules — which could slash US solar installations by two-thirds through 2022.